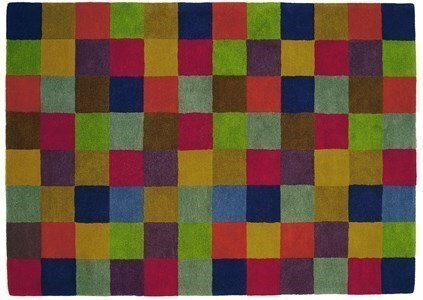 Cuadros... A classic, 20 colors ... A decorative melody in your home. This rug was born from a seemingly accidental combination of shades, but actually follows a very specific linear sequence. In one of the visits to employees in India, observed a showcase of wool fibers arranged by tones and Nani Marquina visualized the embryo of one of the flagship projects of the company. Twenty colors form the magic board of vibrant colors that create a rhythmic sense of movement. Has density of 55.813 knots/m2. The height of the pile is 14mm and the total height of the rug is 20mm, weights 4,15kg/m2.